I had a booking on train Patna to Ernakulam (6310) dated 23 July 2010. 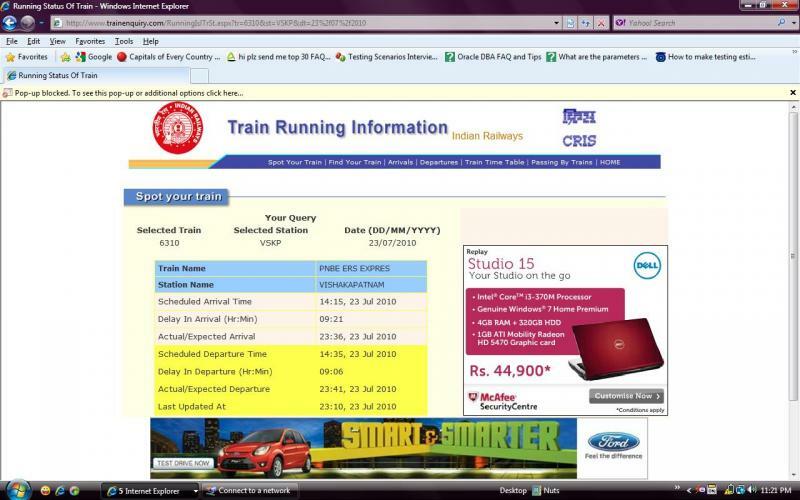 The information displayed on http://www.trainenquiry.com , partner of official site of Indian Railways says that this particular train was running late by 9hr 06 min and its revised daparture was 23:41. So because of wrong information and carelessness on indian railways we missed the trains. So my request is if they dont have correct info please dont publish anything wrong. D.O.J 29-Mar-2018. The information given by Patna Railway Station Enquary is train is on platform 5 but actually train is at platform 6. My train is miss.please refund my amount immediately.and take necessary action to patna platform or enquiry or suspend his/her. What I want to suggest that concerned railway people should be more vigilant about the updation of information to the public to avoid such situation.